Home » Hygiene » Why Do You Need To Floss? The question why you need to floss is best answered by asking another question. Why brush your teeth at all? Every answer to that question applies to flossing tenfold. Flossing reaches the small and tight areas of your teeth that food, popcorn shells, and other things like to get stuck and between your gums and your teeth. Your tooth brush doesn’t even touch these areas. Secondly, your tooth brush doesn’t reach down into these trouble spots where the plaque or biofilm grows undisturbed. When unflossed for extended periods of time this buildup will harden into tartar or calculus. Tooth brushing and flossing cannot remove calculus. A dentist or a dental hygienist have to remove it. Within an hour of a cleaning the teeth, the biofilm or plaque starts to form. It takes 24 hours for it to become destructive. The biofilm is like a community. It has to be organized. It has bugs that bring in food and bugs that take out waste. That is why after 24 hours the biofilm is ready to go to work at the teeth and gums. So it isimportant to brush and floss at least once a day to keep that bacteria unorganized. If plaque is left too long it will form an acid with the food that you eat and destroy the enamel of your tooth and develop into a cavity. A symptom of a cavity is that it can be sensitive to sweets. Ogden dentists agree that at this point there is nothing you can do other than visit the dentist, or live the rest of your life in pain. Cavities do not heal by themselves; the tooth material that is affected is dead and decaying. If left untreated it will spread eventually resulting in the complete loss of the tooth. 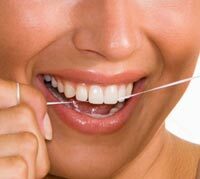 Flossing your teeth will also prevent gum disease. Anytime your gums bleed that means there is gum disease or gingivitis. It takes two weeks of really good homecare (brushing and flossing) to get the gums to heal. If left untreated the gum disease or the infection in the gum eventually reaches the bone that is supporting the teeth and destroys bone. When there is bone loss, it is called periodontal disease. Bone doesn’t grow back or heal like the gums do. Once the bone is gone it is gone and the teeth become loose and eventually will come out. There are treatments that can be done to prevent further bone loss and deterioration, but they can be uncomfortable and expensive. It is much easier to prevent periodontal disease than to cure it.